"I collected comics even before I got into wrestling, and as a collector myself I want to make this a real collector's item! 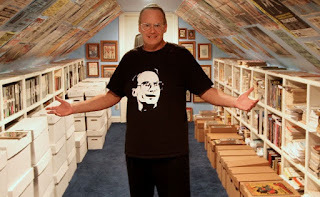 I've been telling stories for years in my columns and on my podcasts" says Jim Cornette. "But you know what they say, a picture's worth a thousand words. So sixty pages of pictures should be enough room to tell a heck of a lot of amazing stories. I can't wait to take people behind the scenes and have them SEE some of my favorite moments illustrated by an awesome team!" The book will feature three chapters of tales, hand-selected and presented by Cornette and adapted by the team of Easton and Medri. Through Kickstarter, IDW Limited will be able to grant additional content and opportunities to Cornette's loyal fans and fans of Pro Wrestling overall. Additional perks will include original art, personal conversations with Cornette himself, and even the ability to go down in infamy by being drawn as a heel character directly into the graphic novel! "I'm a big fan of Jim Cornette's storytelling - both in the ring and through his podcasts. I'm beyond excited to work on this project and explore the modern history of pro wrestling with a man who experienced it firsthand," said Easton. "Obviously we're passionate about pro-wrestling, and the chance to return to the ring has us flexing our creative muscles!" said Medri.